The Big Kahuna Burger is one of many recurring figures that establish a consistent universe among Quentin Tarantino’s movies, along with the Vega brothers and Red Apple cigarettes. The Hawaiian burger joint pops up in Death Proof, Four Rooms, Pulp Fiction, and Reservoir Dogs, as well as Robert Rodriguez’s From Dusk Till Dawn. It’s the burger that Samuel L. Jackson maliciously takes a huge bite out of while tormenting a chap named Brett early in Pulp Fiction. “This is a tasty burger!” Jackson tells the terrified man. If you would like to make that tasty burger and experience the joy that Jules did, a new video is here to help. The video sort of cheats, since, by its own admission, the Big Kahuna Burger itself is not exactly inspiring—just some cheese and ketchup. It jazzes it up by smashing the beef against a smoking hot cast-iron skillet, like they do at Shake Shack and In-N-Out, before moving on to make a true Hawaiian burger, caramelizing some pineapple, and placing it all on a Hawaiian roll. 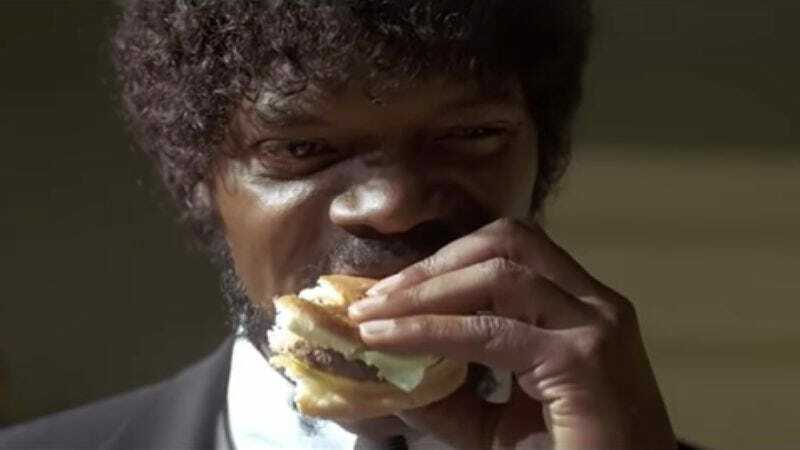 Both actual burger and inspired-by burger seem tasty enough to satisfy a hungry Samuel L. Jackson, or at least tide him over until he kills you.